Home Outdoors Gardens and Green Spaces How Does Your Garden Grow, Willie Jane? Talking garden to glass with Geri Miller of Cook’s Garden and Willie Jane’s mixologist Derrick Bass. At Brad Johnson and chef Govind Armstrong’s Venice restaurant Willie Jane, fresh ingredients aren’t merely handpicked from a farmers market or foraged from the wild. Pshaw! That’s too easy. Instead they’re grown in its backyard. Cook’s Garden, an urban farm by Home Grown Edible Landscapes, occupies the lot right next door to the restaurant and grows tomatoes, herbs, cucumbers, okra, beans, squash, and lettuce to name a few, in several 4-by-8 plots for Willie Jane. The garden, which opened this past June, has also leased boxes to Abbot Kinney restaurant neighbor Joe’s Restaurant. Other boxes are reserved for local home cooks. They also plan 90 days ahead of time. “We’re not transitioning into fall season until November. October can be a hot month and we don’t like to chance anything,” Geri said. Such a huge cushion of time also allows them to accommodate chefs or mixologists who want something that can’t be found commercially. “It gives us a chance to find the seed and propagate the plant,” Geri said. Willie Jane mixologist Derrick Bass (formerly of Eva Restaurant) has a dedicated plot for his cocktail ingredients. “We’re growing heirloom tomatoes he may use in his Bloody Marys. We have watermelon that we’re growing vertically, like Sugar Babies and Sakata melons. A Citron Geranium he used in a vodka infusion,” said Geri. “I made it with a sweet tea simple syrup,” added Derrick. Inspired by this new method of customizing ingredients, Derrick has learned how to pair certain herbs with specific spirits. Here’s a basic guide. 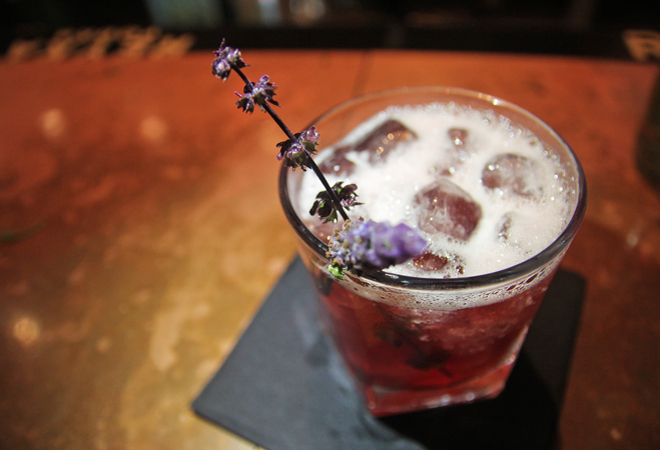 Vodka: Light and sweet herbs like citron, geranium, lavender, thyme, and rosemary. Willie Jane, 1031 Abbot Kinney Blvd., 310-392-2425 or williejane.com. What’s the Story Behind the VENICE Sign That Hangs Over the Intersection of Windward and Pacific Avenues?